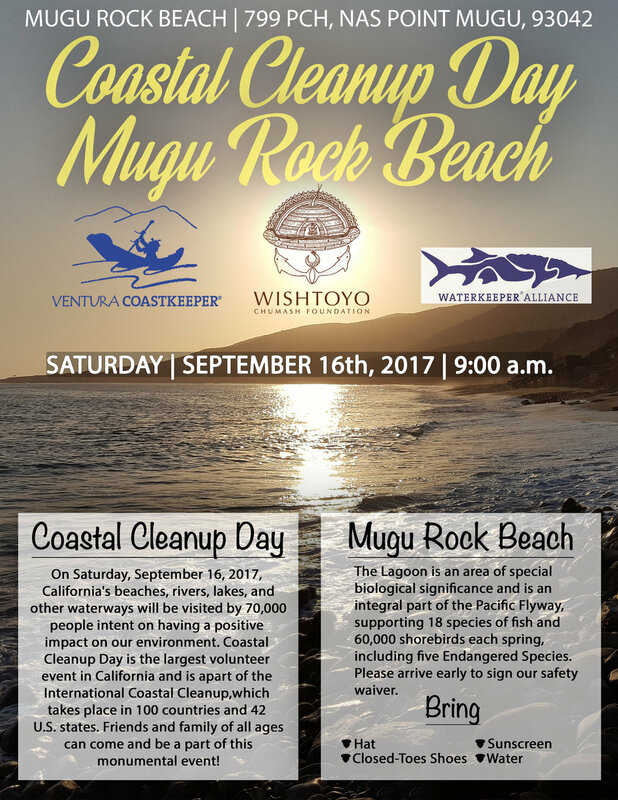 Join Wishtoyo Foundation and its Ventura Coastkeeper program at Mugu Rock Beach for the California Coastal Commission’s annual Coastal Cleanup Day on Saturday, September 16th, at 9:00am. Mugu Rock Beach is adjacent to Mugu Lagoon and is home to the Chumash Village of Muwu. The Lagoon is an Area of Special Biological Significance and is an integral part of the Pacific Flyway, supporting 18 species of fish and 60,000 shorebirds each spring, including five Endangered Species. Please arrive early to sign a waiver (under 18 needs parent or guardian to sign). On Saturday, September 16, 2017, California's beaches, rivers, lakes, and other waterways will be visited by 70,000 people intent on having a positive impact on our environment. Coastal Cleanup Day is the largest volunteer event in California and is apart of the International Coastal Cleanup,which takes place in 100 countries and 42 U.S. states. Friends and family of all ages can come and be a part of this monumental event! You can help create safer and healthier beaches for our communities and the wildlife we share them with. Hope to see you there! Sign up for this event can be found following this link to Eventbright. For more information please email Wishtoyo Chumash Village's Event Coordinator Kote Melendez at Kmelendez@wishtoyo.org. We ask that you please print and complete the waivers attached and bring them with you to the event. Find waivers HERE.